The idea of The Grove Community Garden was established by the community for the community. 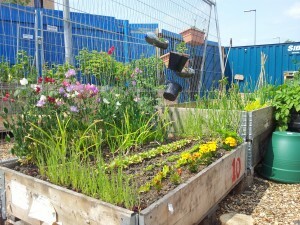 They are a mobile community garden that is making temporary use of two sites in the heart of Edinburgh. They have been working on the idea together with the developer Grosvenor since 2012. Since spring 2013 they have transformed an unused development site (owned by Grosvenor) into a garden that is thriving to become a community hub. Since spring 2014 they are gardening on a second unused development site (owned by Edinburgh City Council) which is only 3 minutes walk from the first garden. The original idea based on mobile plots, has evolved into unique standard pallet bed units, which can be moved about into different layouts by forklift. One part of the garden is dedicated to pallet bed units giving local people the chance to growing their own veggies, fruit and herbs in an inclusive and supportive surrounding. The rest of the garden is a shared communal space, with the garden being ideally placed to accommodate social, cultural and environmental activities. They have a welfare container where they can boil the kettle and a storage container for their tools. The garden relies completely on the Gardeners and Friends of the Garden for its upkeep and maintenance. 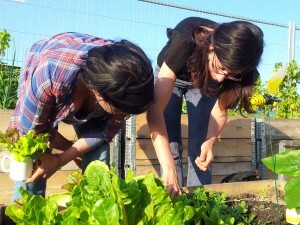 You can become part of the garden even if you have no previous gardening experience. You will learn through engaging with the community. If you want to visit simply come along to one of our communal gardening sessions.